I love enchiladas. So much so, that I’d like them for breakfast filled with eggs and chorizo. I’m all Dr. Suess about them. Please give them to me topped with salsa verde, out on the town, at the picnic table, for dinner, for breakfast, with leftovers, with newovers, topped with quickly whisked chili powder enchilada sauce, filled with BBQ, topped with gouda, topped with goat cheese. I just want them, ya know? So when I realized brunchiladas could be a thing, I knew mimosaritas had to be thing. And these two pair together so well! They’re like Tegan and Sara, Fitz and the Tantrums, breakfast and lunch, mimosas and margaritas. 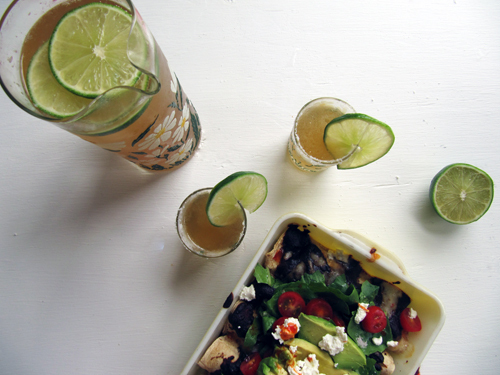 I suggest you get your fiesta on brunch-style. But beware, if you eat these at your picnic table they just might bring all the boys to the yard, and they only serve 2 or maybe 3. So be prepared for that. And these can be vegetarian so simply! Just exclude the chorizo and live your life. Merry brunchmas! Preheat your oven to 350F. Make the enchilada sauce by heating the olive oil in a saucepan over medium heat. Add the clove of garlic and cook until fragrant. Add the spices and sugar and whisk together. Add broth and the flour one teaspoon at a time until thickened. Add salt and pepper and additional spices to taste. Warm the tortillas in the microwave for a minute for easy rolling. Cook the chorizo, and set aside. Beat the eggs and milk, with salt and pepper until frothy. Cook and scramble eggs in a small greased pan until cooked most the way. Add half of the monterey jack, beans, chorizo and a tablespoon of the enchilada sauce. Finish cooking eggs. Spread a quarter cup of enchilada sauce in a small casserole dish. Divide egg mixture between each tortilla. Roll and place seam-side down in the baking dish. Cover with remaining enchilada sauce and monterey jack cheese. Bake for 12 minutes or until bubbling. Remove from the oven and cover with crumbled goat cheese, avocado and tomatoes. Toss greens with red wine vinegar and salt. Top the enchiladas. Add hot sauce to taste. Serve with mimosaritas! Make a simple syrup by heating the brown sugar and 1/2 cup water together in a small saucepan. Stir until all the sugar is dissolved. Set aside until room temperature. Pour into a pitcher. Add lime juice and remaining 1 1/2 cups water. 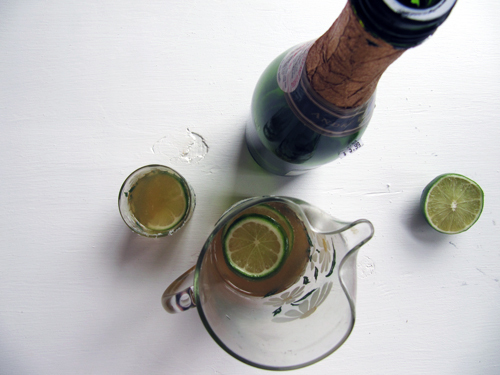 Add champagne and serve in salt rimmed glasses. Best breakfast ever. Yes freaking please!! You had me at mimosaritas! Genius!! Thanks, Brittany! They were totally margarita-ish! Is there anything like a drink at brunch? THAT is luxury. But who am I kidding? I may come for the mimosaritas, but I STAY for the brunchiladas. I like the way you think, sista. I love the idea of brunchadilas! And especially mimosaritas! Genius. YES! 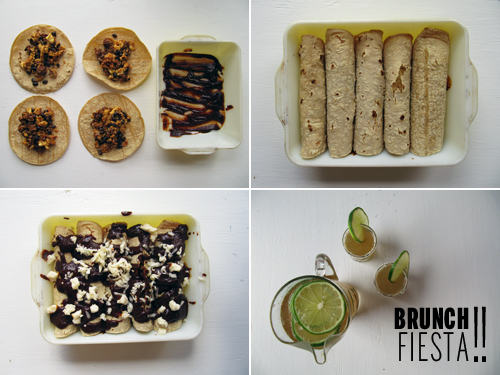 I’m so glad you made all of this happen, brunch fiesta style! It’s tough to resist an enchilada, anytime! You make all of my food dreams come true!! It sounds like the best brunch of all time. OH HELL YEAH. Enchiladas for every meal! Right?! I’ve got another version up my sleeve. You best believe! Oh man, these sound fantastic! 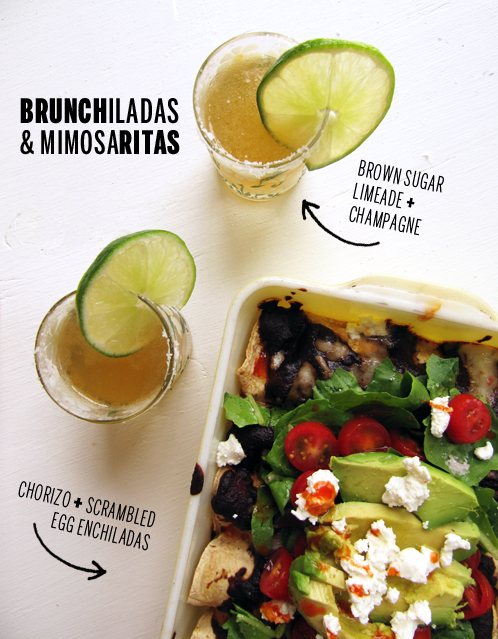 They make me want to throw a huge brunch party with a quadrupled pan (or several pans I guess) of amazing enchiladas. Thanks, Eileen! 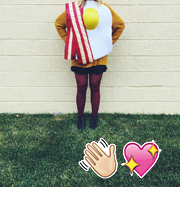 You should totes throw a brunch party! I need ALL THE THINGS here in mah belly. No seriously. Need. You are so right these dooo go hand in hand! I love this combo and that delish seasoning combo in the enchilada sauce! YESSSSSSSSSSSSSS! Enchiladas in any form are magic but these look out of this world! Thanks, Amy! You, me, and Cindy should probably hit up Mexican town and get some enchiladas soon! I can’t imagine a better Sunday brunch!! Looks so good! Thanks, Taylor. It was a fun one! Such a fun brunch idea – can’t wait to try it! Umm DELISH! In TX we LOVE our Mexican breakfast (mostly breakfast tacos). I love how this is something different while not forcing me out of my mexican-hungover-sunday-morning meal. Going on my must-try list! Yay! Mexican breakfast is sorta the best. Love it! Yay! Glad you found me! Thanks, Liz. There are no words for how amazing this looks – I can’t wait to try! I love your blog!!! Your design is the bidniz & your food looks to die for <3. Keep up the good work! I think these words need to be submitted to Webster’s ASAP! Way to break down breakfast borders! Can’t wait to brunchiladas and mimosaritas, they sound amazing! 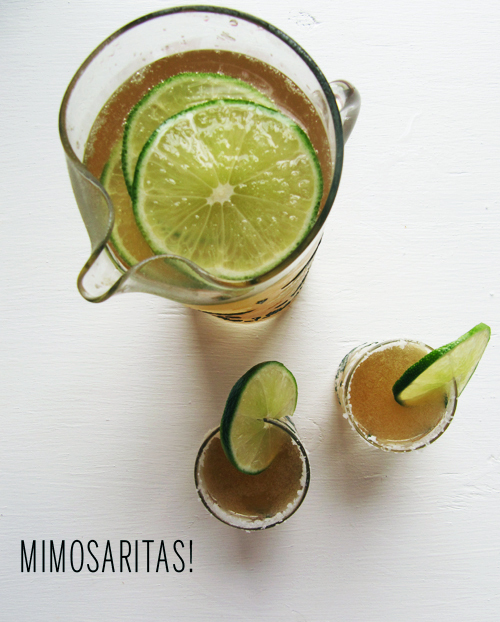 Mimosaritas are absolutely genius! Fabulous idea! Thanks, Kelly! I’m glad you found me too. I absolutely love your take on the enchiladas. Thank you so much for the blog love. Have a great weekend. You had me at mimosarita. 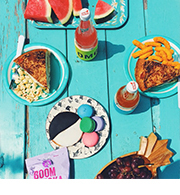 Brunch is the best thing ever and fiesta style is totally the way to do it! They look great, but just one question where do you buy those tortillas? they look good and not the fake kind that I get in Meijer. Hi Megan, the breakfast enchiladas are just what I am looking for a shower. Can you assemble them the night before and bake the dish in the morning?